Smart Cell has been providing and upgrading it's services all over Nepal. It's internet service is cheaper as compared to other mobile networks. It has launched 4G in may cities in Nepal and extending it to more cities rapidly. In this post list of Internet (GPRS) packs will be posted. 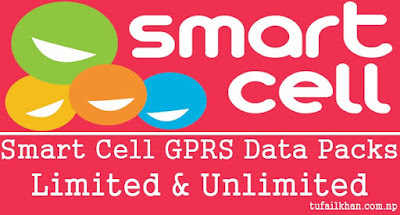 Smart Cell provides both limited as well as unlimited data packs. Limited volume based data packs for Smart Cell. You can dial *141*6# and follow the instructions. 4G limited volume based data packs for Smart Cell. You can dial *141*6# and follow instructions. 2G limited and unlimited data packs for Smart Cell. That's all. If you have any query you can contact Smart Cell's customer call center by dialing 4242 from you Smart Cell network number or 9611004242 from other network operator. Drop comment if you have any query.